The only thing missing is the star of the show. When she hears that performer Cassie Cassava (American Idol finalist Melinda Doolittle) is coming back home to sing in her church’s Easter service, Marlee contrives to steal the singer for her own program. She’s just trying to help her fellow “Crispers.” A big production needs a big star, right? But of course, nothing ever goes as planned. When disaster strikes, will Marlee’s big dreams disintegrate? Will she discover what will truly help others? What is Easter really all about? As Marlee struggles with the collapse of her theatrical dream, her friends gather around to encourage her and point her in the direction of Easter’s true significance. She thinks “bigger” means “more important,” that good drama needs flash and show. But she learns that Easter’s message of forgiveness and hope doesn’t need a big spectacle. Jesus “came not to be served, but to serve, and to give his life as a ransom for many.” The message from Mark 10:45 resounds throughout the story. 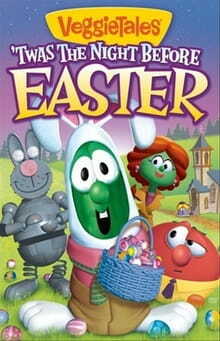 This newest Easter-themed VeggieTales show (the first since 2004) features Bob the Tomato as the good-hearted but slightly grumpy Pastor Erwin, Mr. Luntz as the slightly crazed robot rabbit creator, and the rest of the usual Veggies as townspeople and singers. The music, always funny and clever, is better than ever. Because Cassie is coming to sing in an Easter church service, she and the choir naturally belt out gospel tunes heavy on soul. Doolittle showcases her talent through Cassie, adding a delightful new character to the Veggie family. Big Idea Entertainment is using the launch of this DVD to partner with World Vision. The DVD includes a short promotional video with a special message from Bob and Larry on the opportunities for child sponsorship. Also releasing in conjunction with the DVD is a special music CD, VeggieTales: Hosanna! Today’s Top Worship Songs For Kids!, featuring award-winning artists Amy Grant and Casting Crowns’ Mark Hall. ‘Twas the Night Before Easter contrasts the popular sentiment that “bigger is better” with the gospel truth that Jesus’ sacrificial death and resurrection is our true source of hope. The writers did not flinch from including direct references to Scripture and the Bible’s themes of hope and salvation. In this VeggieTale, the gospel message shines bright and clear.